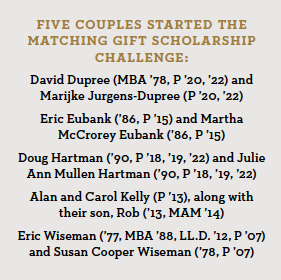 Five Wake Forest couples are funding a matching gift program to challenge alumni, parents and friends to establish scholarships. The matching program could help create as many as 55 scholarships for middle-class and first-generation college students and those with financial need. The five couples, who committed $1 million per couple to kick off the challenge, are: David Dupree and Marijke Jurgens-Dupree of Washington, D.C.; Eric and Martha McCrorey Eubank of Charlotte; Doug and Julie Ann Mullen Hartman of Austin, Texas; Alan and Carol Kelly of Alexandria, Virginia; and Eric and Susan Cooper Wiseman of Greensboro, North Carolina. Each couple designated part of their gift to scholarship funds they created and part to a matching pool. Four couples designated half of their gift, or $500,000, to the matching pool. The Hartmans committed $250,000 to the Hartman Family Scholarship and $750,000 to the matching pool. The result is a matching pool of $2.75 million. Here’s how the challenge works. Donors who make $50,000 gifts — payable over a number of years — can use $50,000 from the matching pool to reach the minimum $100,000 required for a scholarship. Thirty-two scholarships have already been funded through the challenge. “The multiplier effect is phenomenal,” said Alan Kelly. Drew Dixon (’90, P ’16, ’20) and his wife, Kelly, of Winston-Salem, used the match to create the Dixon-Kelly Scholarship. The “Kelly” part of the name was a nice coincidence, Dixon said. It’s not from his wife’s first name, but from the matching funds given by the Alan Kelly family. Now the two families are connected through the scholarship. “It brings people together from different parts of the country, from different class years, who often don’t know one another, but who share a common goal to address student debt." Kara Prestage Van Duzee (’98) of Dallas also used the match to create a scholarship years earlier than she could have afforded. Her gift, combined with the matching gift from Doug and Julie Ann Hartman, created the Van Duzee-Hartman Scholarship. The order of the names is intentional; the donor who uses the match is listed first. Both donors can meet the student who receives the scholarship.